Whether you are someone who loves travelling yourself or you are looking for gifts for someone in your life who loves to travel, I've got you covered. Shopping for someone who loves to travel can seem hard - they're never in one place for too long! With this guide, I've got something for every kind of traveller - those who are constantly on the go, those who have just returned from travelling and those who are about to go. Scroll down for some inspiration and a fab opportunity to win one of the gifts yourself! Every travel lover needs a world map in their home - but what about one that comes with pins so that you can mark where you have been or where you are going? There is nothing more satisfying than marking off places or countries that you have visited, and there is nothing more exciting than planning your next destination. Get the travel lover in your life a big map like the canvas ones from HelloCanvas. Not only are they a great way to decorate a home, they're also a fab alternative way to document all of the places that you have travelled to. Unless you have somewhere to put your jewellery, travelling around with it and keeping track of it can be a bit of a nightmare. If you know someone who is off travelling soon, make their life easier by buying them a travel jewellery box like this gorgeous one from Oliver Bonas. It is the perfect place to keep rings, necklaces and earrings - just remind them to always keep it somewhere safe when away. Psst - this is currently reduced to £5 from £24! For anyone who loves travelling and food (the two do go hand in hand), a global cookbook can make a great gift. Rather than buying a cookbook that focusses on one cuisine, get one that features recipes from all around the world. Remind them of all the delicious dishes that they have tried around the world and encourage them to recreate these dishes (and invite you over to eat them, of course!) Cookbooks like this one, this one and this one (pictured above) will be a welcomed addition to any traveller's bookcase. Simple, but important. Get that traveller in your life a passport holder like this one from Skinny Dip London - not only does it jazz up a passport and add some colour, it also protects it from damage. When Lewis and I were travelling in South East Asia his passport was damaged by water and he had to get an emergency travel document as a replacement - which meant that we had to change our travel plans entirely as some countries did not accept this in replacement for a passport. Avoid the situation and invest in a passport holder! How gorgeous is this pillow from 521Handmade? This would make the perfect addition to any wander-luster's bed or sofa. It's also perfect for putting in the car (or van) for road trips. Every traveller needs a diary to write down their memories, findings and experiences in. These stub diaries from Uncommon Goods make the perfect gifts for anyone due to go travelling. Keep brochures, postcards, snapshots, ticket stubs and other important travel memorabilia in the sleeves and jot down your memories on the journal pages. Keeping memories safe is made easy if you have one of these with you. 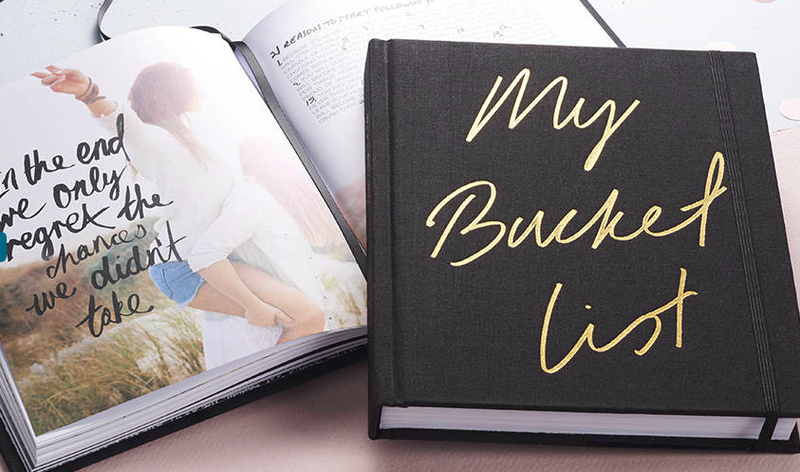 Following on with the theme of journals and writing, this 'My Bucket List' journal from Axel & Ash is a must-have for any wanderluster with big goals and travel dreams. The journal contains inspiring quotes, interviews with successful men and women, a world map, global photography, space to insert pictures and - of course - 101 bucket list items. These scarves from Speak Easy Supply Co are a genius idea and make the perfect gift for someone who loves to travel. Not only will it keep them warm and cosy in the colder climates, these scarves have hidden zippered pockets to store important items such as a passport, phone, credit card or money. The pocket will keep the item completely out of sight and put traveller's minds at ease. This beautiful wooden 'Wanderlust' sign by Woodums is the perfect decoration for any travel-lover's home (or room). The custom laser cut sign either comes unfinished or you can have them paint it. It would look gorgeous hung above a bed or a fireplace! If you want to get someone who loves to travel something really useful, then opt for some travel toiletries. Not just your standard toiletries like shampoo and conditioner, however - I'm talking toothpaste and mouthwash in the form of tablets and shampoo in the form of powder and solid balm. Lush do some fab little toiletries that are perfect for travelling. Simply dust some dry shampoo powder into your hair for a boost on-the-go or chew a tablet of peppermint mouthwash for a quick way to freshen up. 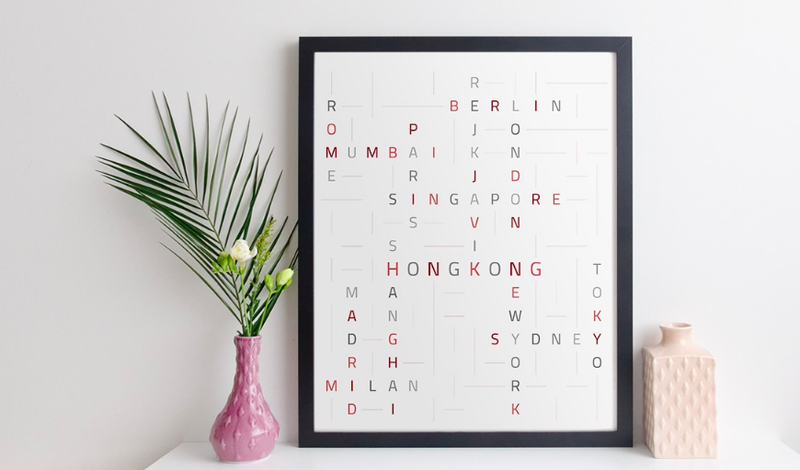 ElevenCorners have come up with a beautiful and creative way to remember your travels - in the form of a personalised crossword print. This is an original and different way to document and record places that you have been - and it makes the perfect decoration for any travel-lover's home. You can also add the dates of your travels printed underneath as clues for an extra personal touch. This unique print is the perfect way for that person who loves travelling to celebrate all of their different travels. GUESS WHAT? I'M GIVING YOU THE CHANCE TO WIN THE ABOVE ELEVEN CORNERS PRINT! Love the look of the Eleven Corners Personalised Crossword Print? Enter my giveaway below via the Rafflecopter Widget for your chance to win your very own personalised crossword print! The giveaway ends at midnight on the 9th December - so your print should arrive just in time for Christmas. What items do you have your eye on? I had a mad thing on Lush for along time, I do like to look of pillow that is so nice. These are really lovely ideas for those that like to travel. Some of my friends visit somewhere new sometimes a few places each year so I should maybe get them a few things like these for Christmas. For myself, to show all the places I've travelled for pleasure and for work! I love the ticket stub book. I do something similar with all of my concert tickets - it is a fab way to look back on all the memories! I think I would like to go to Canada with my niece. Would love the world map, I've tried to write down everywhere I've been before and I was pleasantly surprised with how many places I got to tick off. The wanderlust sign would make the perfect gift for my travel lover friends! Thanks for this awesome post! There are some lovely ideas here, particularly like the idea of the map with pins. Reminds me of some old family friends who had a holiday cottage we used to visit. They had a wonderful map on the wall with places marked that they had been, I used to sit in awe at the map. Such a great gift guide! I love the idea of the travel jewelry box - so smart! What gorgeous items! I love the map, and the pillow & the Wanderlust sign is beautiful! Such great gifts - I've seen the world map with pins before somewhere and thought it would make a great gift for my friend so thanks for reminding me about it! That Wanderlust sign is super cute too! Oh my goodness, the my bucket list book and wanderlust metal sign is GLORIOUS! I've a clock with map of the world face -able to mark it with my visits. This would be great alongside. I would love this for ourselves to remind us where we need to visit! Bucket list destinations are important!! For my mum as she travels a lot! It would be for my husband and it would include every state of the USA because we have visited every one of them including Hawaii and Alaska!